Henry Deisel, Sr., was born in Gieselwerder, Germany on June 6, 1862. At the age of nineteen, he emigrated to America, coming to Lima in 1881. He had received a good education and was skillfully instructed in the craft of cigar making. In the early days, Henry rolled cigars at his home assisted by his wife, Emma Wolf Deisel, selling the product to the public. He became associated with Henry Sonntag, a local pioneer of the profession. Through this association he met William and Henry Wemmer in 1891, forming the Deisel-Wemmer Co., later known as the Deisel-Wemmer-Gilbert Corporation. 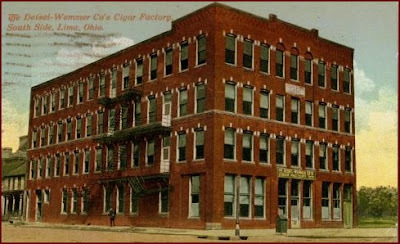 Initially the cigar company operated a small shop at 326 N. Main Street. Later a larger building on Main at the Pennsylvania R.R. was erected, with branches rapidly extending throughout the region. Soon the Deisel-Wemmer establishment became well known throughout the country and eventually worldwide. Henry Deisel was also a deeply religious man. After early joining the German Reformed Church, his musical talents were immediately recognized. He became Choir Director for many decades, leading anthems in both German and English. On January 19, 1911, Mr. Deisel along with Fred Herold and George Urich as assistant directors formed the popular men's singing ensemble "Der Maennerchor" which was highly acclaimed in the area. Blessed with an abundance of material goods and talents, Henry Deisel remained true to his Christian convictions, being a generous benevolent gentleman. Sadly the vibrant life of Mr. Deisel came to a tragic end when he was thrown by his horse while riding on Eastown Road, suffering a heart attack, on November 29, 1932. "Lima became distinctly poorer yesterday through the death of Henry Deisel, Sr. The passing of this kindly friend and valuable citizen left a vacancy in the community that coming generations will find difficult to fill." "As long as the Lord gives me strength, I want to continue this work of church music for I have gotten to know the members of this choir and I love them."